Disney’s 2010 revival of Alice in Wonderland, directed by Tim Burton, one of the most unique and self-indulgent stylists in Hollywood today, tells the story of Alice’s return to Wonderland, lured back by all the fantastical characters she met when she was just a girl. The Mad Hatter, who is kept on the screen for far too long, the White Rabbit, and the Dormouse need Alice because the Red Queen has overthrown her sister the White Queen and has brought a sort of dark ages unto Wonderland. Why do they need Alice? Because a Harry Potter-like magic scroll has revealed that on this day, Alice will slay the Jabberwocky and thus overturn the Red Queen’s rule. I doubt if modern audiences have actually read Lewis Carol’s original books. I certainly didn’t, not until Burton’s Alice in Wonderland was announced, and I must admit I was excited to see it. The books have a magic that is unique to literature; it is not Carol’s story or even his beloved characters that makes his two Alice adventures classics. It is his language, and so putting the rather uninteresting structure of Carol’s books on screen like in the 1933 live action Paramount Pictures adaptation will result in failure. The Disney animated film from 60 years ago kept to that structure as well, but highly influential character designs and voice acting made that adaptation passable. It is still one of the weaker Disney’s pics. But here we have a completely new story, one that owes a lot more to the film adaptations of Lord of the Rings than Carol’s fantasies. As mentioned, Alice is now a young woman and reluctantly about to be married off. She discovers the White Rabbit at her engagement party, follows him down the rabbit hole, and repeats many of the same adventures as when she was first there, including changing size to fit through the small door with a key at the base of the rabbit hole. 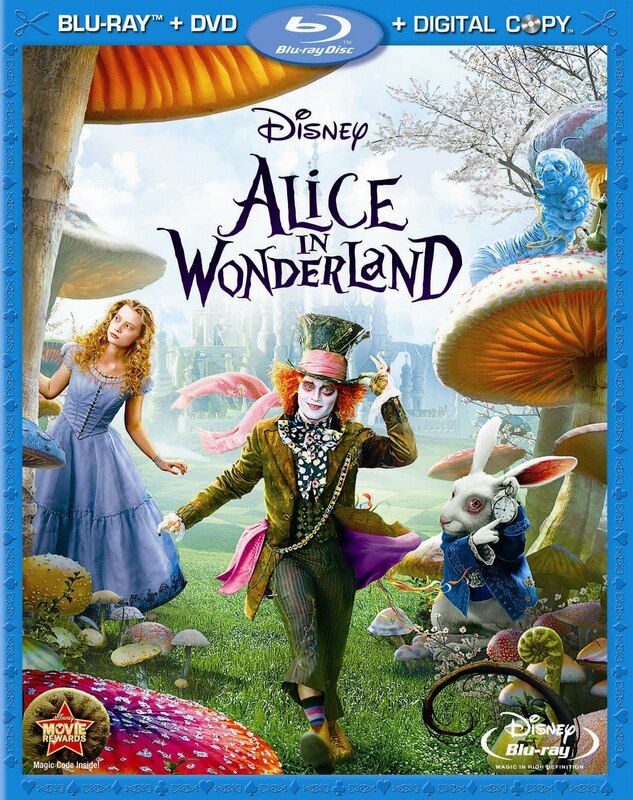 The climax of the film has Alice donning a suit of armor and she and the good creatures of Wonderland face off LOTR-style against the Red Queen and her army of deadly playing cards. Such tired material. Instead of presenting a somewhat experimental film trying to utilize as best as possible the integrity of Carol’s language or at least the book’s spirit, this material is padded down to engage the widest possible audience with familiar material so they leave the theater superficially satisfied. That really shows just how little major studios think of their audiences. This film exists solely for the box office, cross-promotions, and of course home video sales and digital downloads. It is a sad reminder of the times. So much imagination and money are put into an epic project and no one bothered to create something special to market. It is unfortunate that Tim Burton directed this film. The material seemed brilliantly suited to Burton’s tastes. His films are almost consistently beautiful, from the noir-ish Batman to his expressionistic films exemplified by Edward Scissorhands and Sweeney Todd. Todd is Burton’s masterpiece. It is one of the best screen musicals due not only to Burton’s visuals or even to Sondheim’s marvelous melodies, but to Burton’s intimate storytelling. Into Alice in Wonderland so many characters are stuffed without clear motivations or purpose simply to incorporate all the famous characters from the Disney original. Things are so unfocused and disorganized that by the time the lame climax arrives, we hardly know why they are fighting, and even less do we care. But why are the characters from Alice in Wonderland fighting at all? This is a problem Burton has had with many of his films. He cannot bring a narrative to a satisfactory conclusion. His obvious talent, to me, seems more suited to experimental filmmaking. A film like Tarkovsky’s Mirror would be a perfect example of the kinds of films Burton should be making, and certainly of the kind of non-narrative structure that Alice in Wonderland should have had. Instead Burton often resolves his films in violence. In Batman it seems logical, expected even, and the story of Sweeney Todd is bloody to say the least. But was it necessary for Edward Scissorhands to impale the ex-boyfriend of the girl he loved? Is it a matter of economy to end the story quickly and give audiences a momentary jolt and sense of resolution? Or is it a lack of talent? With Burton, no; the talent is there. He is a fine director. He needs to work with his writers to create stories that develop naturally and support the more important material that leads to a climax. But while I have praised his visual style, Burton’s Wonderland is severely underwhelming. There are several settings that resemble rather too faithfully the scenery of the Lord of the Rings, especially the exterior of the White Queen’s castle. The cliffs and waterfalls are so much like those that surround Rivendell that to call it homage is stretching it. Aside from the lack of originality in the production design, the CG devours the integrity of the movie. The only effects that look spectacular are the Red Queen, how her head towers over her body, and the White Rabbit, who looks so pure he feels like the only character that escaped unscathed. The Cheshire Cat looks good too and in fact has many great lines and moments. But everything looks fake. There is no texture and that’s what Burton’s films are all about. There is a large tiger-like fantasy creature that looks to be made of rubber. The scenery, which was all created digitally, meaning the actors performed almost entirely in green-screen rooms, looks ludicrous. Anton Furst erected Gotham City for Burton 22 years ago! Why can’t it be done now? Of all the things wrong with this film this irks me the most. Tim Burton is not a director who can rely to CGI and computers to tell his stories. He creates much better with on-set texture. Some behind the scenes footage of Burton at work on Sleepy Hollow shows him painting blood on a tree with his own hands. Who can create in a neon-green room? There is such a lack of artistry throughout Alice in Wonderland that is really disheartening when thinking of the state of Hollywood movies. Mia Wasikowska is a splendid Alice. She is a beautiful young woman and fits brilliantly the look of Burton’s waif-like heroines. She very well could have the talent to back up her beauty but the story doesn’t let her do much acting. Still though, I’d like to see her develop into a major young actor. Of course though, Johnny Depp is the major cast draw. This is his seventh collaboration with Tim Burton and one of their weakest. The Mad Hatter is so boring and quite frankly annoying to look at, and I found his obligatory romance with the adult Alice somewhat uncomfortable. Anne Hathaway is equally annoying, though her excellent white dress is a testament to the tireless talent of costume designer Colleen Atwood. Helena Bonham Carter is very enduring as the Red Queen; the CG effects make her look quite weird and I enjoyed her performance a lot. Burton has never had problems with his actors. This is an area where no one comments on Burton; his characters can be weakly developed but his performers always deliver something, and these in Alice in Wonderland are about as bad as they get and overall it’s pretty good. I may be being unduly hard on this film, but Burton is a terrific talent, much better than this film gives him. I want to see him doing better work. I was so disappointed by this film, especially coming off of Sweeney Todd. I think Johnny Depp has a quirky quality that attracts mainstream audiences and young, “hip” audience members who too are in the mainstream but pretend they are not. It is a shame the writers couldn’t have engaged our imaginations further. There are many untapped elements in Lewis Carol’s stories that could benefit from on-screen exploitation. But given what was done in this film, it may be better to close the books and wait for Burton to do better work. Visually the movie is extraordinary. The costumes, the location everything is so fascinating. Watching this movie is an enjoyable experience which is unforgettable.